why wouldn't anyone thought of that? What a great idea ! We mingled with guests and had cocktails and hours d'ouvres with them for an hour- then had the ceremony- then dinner. We loved it and our guests said they did too! Oh man! I wish I had thought of that! Having a Sunday wedding in which you're not too bothered about tradition makes things pretty easy. The wedding will be the end of a long weekend of fun instead of the only highlight or time to spend with family/friends, we'll do pictures before the ceremony so we can just mingle at cocktail hour as folks arrive, and we'll go into another cocktail hour/mingle as we wait for the reception food. And because there are mobility challenges in both our immediate families, we're rethinking the first dance thing and finding new ways to honor family during the reception. For us, the overall standard wedding structure works, but just in a less formalized fashion. 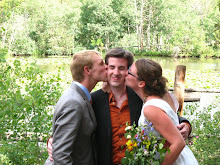 It's the carefully chosen words and personal weddingy moments and things making up the important us-ness of the day. Ha! I wish I could do that. I'd love to have the reception before the ceremony. I had even suggested this previously to everyone involved in my wedding, but I got outvoted by the fiance and the family, so I'm going the conventional route. But power to people who do it the other way! This is not that creative but we're having a Thursday day-time wedding with a lunch reception. The venue we found cost $400 to rent for 5 hours Mon-Thurs or $2500+ for Fri-Sun. So there you go - Thursday it is! We do realize that it might be harder on some people, getting time off work and all but it seems like guests who are going to be there would be there no matter the time or place and others would probably not be able to make it even if it was on a Saturday. We will also be able to have lighter food for lunch so saving some money there and people probably won't drink as much at lunch as opposed to dinner (but who knows!). We are also taking inspiration from you and not hiring a professional photographer, we'll be relying on family and friends (luckily there are some wonderful photographers among them). We're seeing each other before the ceremony for pictures so we minimize our time away from our friends and family in between the ceremony and reception. I know badly we're going to want to hang out, so I threw the hide-the-bride thing too! 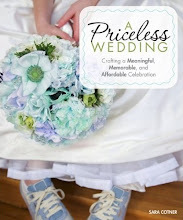 I always love hearing about nontraditional weddings and how people go about them! They all seem to be much more creative and fun! I have never even really thought about changing the scheduling of the wedding! Eating first?! That is new. Taking your photos before is a great idea! No worries about hair and makeup for the good pictures! I think we're having a brunch-y, non-alcoholic schmoozy time BEFORE our noon ceremony instead of a cocktail hour afterward, and then jump straight into the lunch stations afterward. The dude and I will take photos durning brunch (sad) but he's planning on fasting in the morning anyway. I've been to more orthodox Jewish weddings where they've followed a similar timeline, but it doesn't seem to be found in more mainstream sites. i toyed with the idea of dinner first, but as of right now, the reception and ceremony site are in different places, so it'd be a logistical nightmare. however, i think it's a wonderful, inviting concept. we're getting married by a friend, in a garden, with friends as photographers and musicians. 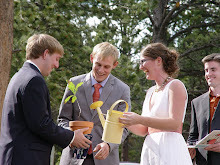 i'm not tossing a bouquet, but handing it out to the longest married couple (thanks to whoever posted that on here!). we're doing a non-traditional registry, and i'm going to have a photo corner with props at the reception. we're skipping the uber-formal rehearsal dinner and doing a casual one at one of the local joints here. No white dress. No bouquet/garter toss. No church or religion. No being walked down the aisle/given away. Friend officiating. Also probably doing BBQ buffet, but not settled yet. Still planning, so who knows what else will be out the window!! We just got married and modified quite a bit. In fact, we found much inspiration on this here blog! 1) we had a talent show instead of a rehearsal dinner...all the guests were invited. we made pizza and drank and sang and made each other laugh. it was unforgettable. 2) during the ceremony, we had everyone standing and surrounding us. 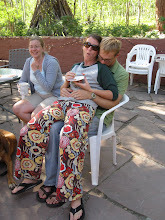 It was such an intimate feeling...our guests really enjoyed this one. 3) we made our own beer! a way to bring friends together--so much fun and so much more affordable! 4) the last one I'll mention (b/c I'm quite proud of it)--I wore red cowboy boots instead of any fancy shoes. I never wear really pretty/fancy shoes, so I thought--why start today!? I needed to be myself. and I was comfortable the whole. entire. day. 1) We got married in a state park where everyone could stay for not much money, as a way to connect with our friends and allow them to connect with one another. We also had activities all weekend to give people opportunities to connect, but also plenty of free time to explore the beautiful park. Instead of a "rehearsal dinner" for a select few, we invited all of our guests to a casual BBQ welcome supper the night before the wedding, with games for the many children in attendance and a bluegrass band (my inlaws planned this and had a ball with it). My mom was really annoyed I wasn't having a traditional church / country club wedding (every time she mentioned it, she said, "well, since you're getting married in THE WOODS you can't have a big wedding cake, I can't wear the fancy beaded dress I like, etc., etc."). But even she had a great time once we were actually in the park. 2) Instead of getting married by a clergy person (we're both believers but neither of us attends church presently), we asked the judge I worked for in my first post-law-school job to perform the ceremony, and it was so wonderful to have someone who knows and loves us guiding us through our commitment! 3) I really wanted hot pink peonies to decorate our reception but they're outrageously expensive and we didn't have the budget to buy even a few of them. My mother in law is a great gardener, so she and her friends literally spent the whole year before our wedding growing enough pink peonies for us to have a ton of floral arrangements for the reception-- we had about four carloads of them! Then they spent the morning of the wedding arranging the flowers and making the reception site outrageously gorgeous. They loved being a part of the festivities and had a lot of fun doing it, and I was overwhelmed by their generosity. 4) We had a few non-traditional elements in our ceremony: a ring-warming among the wedding party, lots of music by our talented friends, a reading from Goodridge v. Dept. of Health (the MA opinion legalizing gay marriage), and a group blessing of our marriage. 5) Not only did my husband and I see one another in our outfits before the wedding and take pictures then, we spent a lot of the day together. We had planned to get married outside but there were monsoon rains so we had to change a lot of plans, and we did it together. I loved being with him that morning, getting stuff done, laughing about the terrible weather and moving tables, then later hanging out together before the wedding instead of hiding from one another. It felt like we were starting our new life TOGETHER. Best decision we made. 6) No matching outfits for our wedding party. They were spread out all over the country so we just asked everyone to wear a navy suit or dress of their liking, we provided matching ties for the guys. All but two or three people already had something in their closet they liked that worked perfectly. Several of the guys asked me what shoes to wear and I just said, "Um, whatever you'll be comfortable in?" I just couldn't focus on stuff like that. And our pictures still looked great. We had a pretty standard timeline: wedding ceremony followed by a short cocktail hour and reception with a buffet dinner, wine and beer (although we skipped bartenders since we didn't have the budget and no one would be driving), cupcakes (you really can't order a wedding cake in the woods), and dancing. We cut a small cake that a friend baked for us because we like to eat cake and we thought the pictures would be cute (sometimes it's ok to make a choice for a photo opportunity-- these photos are our favorites because we're laughing and having fun!). We talked about what we wanted beforehand and we both wanted a really fun party, and that's what we got! This works for us because we can't afford to have a sit-down meal with everyone. We also expect a lot of our family to end the evening fairly early, but we want everyone to be able to come to the ceremony. Still working out the details... if anyone has ideas, I'd be happy to hear from you! Your ideas are simply beautiful! I am reading this blog from Italy, trying to make my weddingg less traditional and more similar to me and my fiance... here in Italy it is not so easy. I warmly thank you and all your brilliant readers for sharing your ideas with us.